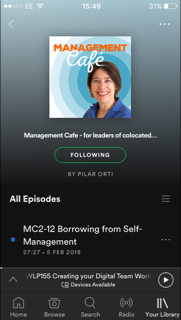 Pilar and Lisette have virtual coffee, talking about the positive and negative aspects of working remotely. 00:30 Pilar's short intro - see below for script. 13:30 The curse of "being always on". How technology is helping people taking charge of their own development. (Check out the episode on Yammer, 42:03). The origins of Working Out Loud. 19:45 Work-life balance, work-life fusion and choosing the location where you want to live, not where you want to work. Feeling "boxed in". The down-side of non-location specific, the freelance aspect. Pilar mentions a "housing crisis in London" - it's actually in the UK. Here's an article about it Article in The Guardian. 27:30 The curses. Is communication more difficult or easier when we're working with others remotely? 46:55 Lisette's interview with Teo Haren. 54:10 Pilar mentions an episode from The Bottom Line on Going Global 12 March 2015. This is the Zapier article Pilar talked about: How to Avoid Burnout in a Remote Team. Lisette mentions Cocoon Projects in Italy. All employees are becoming more entrepreneurial now. Today’s episode is called: Virtual Work: Blessing or Curse? Originally, the episode was going to focus on Burnout, which, as we mention in our chat, was probably pretty much at the front of Lisette’s mind when she suggested the topic, straight after the NoPants festival. Later on, we broadened the subject to something that would highlight the pros and cons of this way of working that is now quite easy to latch onto. So, to prove a point, I’m recording this in Madrid, where I’m visiting my parents, and I’m recording on my husband’s iPhone, because, I am part of that minority that doesn’t have an iPhone and because I’m still not in the habit of carrying my portable recorder with me all the time, I left it back in London. So, a small experiment, I might discover that the quality is just as good as with my handy Roland microphone, and decide it’s time to buy a smartphone, you never know. And this got me thinking that, however possible it is now to do your work from wherever, you still need the infrastructure, you still need to remember to take certain things with you if you go away from your main base. I’m always aware that there is a danger of romanticizing virtual work, or remote work, or being able to work from anywhere, which is why I really enjoyed recording this episode with Lisette. As well as being aware that not everyone can take their work out of the main headquarters or away from the work location, it’s important to realise that there are plus and minuses to working in this way, especially if we are about to make the move. So I hope from that point of view, this episode is of interest and dare I say it, of use to you. And even though technology has enabled mainly freelancers and entrepreneurs to work more freely and in a more networked way, we are by no means focusing on these. Lisette makes the point quite early on that everyone in organisations is now able to be connected to work as much as they want to, need to or feel forced to. And only today, I got an email from one of my voiceover agents who was actually in Rome, on holiday, her words, but she was still pitching for a project and emailing a few of us to get some samples, which she would then send to the client. And she is not freelancing, she’s not the business owner, but she’s still blurring the edges of her working hours. It’s the flexibility that’s important, although as we shall see, this is also a great danger.